If you’ve never tried nutritional yeast it’s time to get familiar with this nutritious food with a funny name. 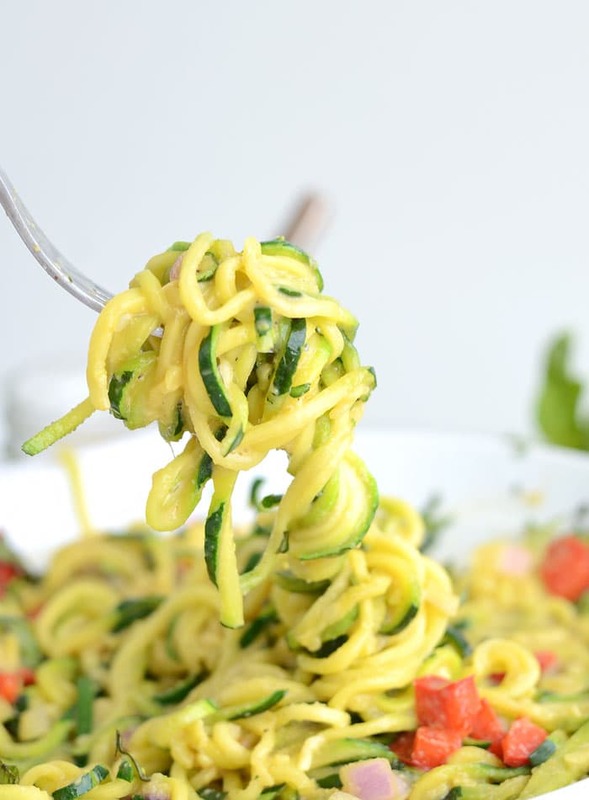 From vegan parmesan to cheesy sauces, it’s a must-have in a healthy plant-based kitchen. We’ll cover everything you need to know such as its health benefits, how to use and what kind of recipes you can make with it. Nutritional yeast is made from a single-celled organism called Saccharomyces Cerevisiae that’s grown on molasses, cane sugar or some other medium. Once it’s harvested, it’s washed and dried then deactivated with heat so the yeast stops growing. It does not have leavening abilities like baking yeast since it’s deactivated during processing. After it’s treated with heat, it’s crumbled or flaked and packaged for use. Nutritional yeast a unique strain of yeast and is not the same as baking yeast, therefore, it cannot be used interchangeably with active yeast in recipes. Using nutritional yeast will not work as a leavening agent as it won’t froth or grow as active yeasts do. And you definitely don’t want to use an active yeast like baking yeast in place of nutritional yeast as you’d most likely end up with a big frothy mess that would taste terrible. All you really need to know is that nutritional yeast is essentially a seasoning enjoyed for its flavor and nutritional benefits and that active yeasts are used for chemical reactions in processes like baking. Nutritional yeast is yellow in color and most commonly comes in flakes but you may see it granules or powder as well. It has a nutty, cheesy, salty, umami flavor and is often used to add a cheesy flavor to dairy-free dishes. You may see it labeled as savory yeast, nutritional seasoning or nutritional yeast flakes. These are all the same thing. Brewer’s yeast is derived from Saccharomyces cerevisiae just like nutritional yeast but rather than being grown on a medium, its produced as a byproduct of making beer. Brewer’s yeast not as common as nutritional yeast however it offers many of the same health benefits as, such as a high-protein content, fiber and important minerals such as chromium, B vitamins, potassium and phosphorus. Does Nutritional Yeast Contain MSG? No, it does not contain MSG. It does naturally contain glutamic acid (glutamate) but it’s bound to other amino acids or proteins and is processed differently in the body than the glutamate in MSG, essentially the body can control how much is absorbed and the rest can be passed off as waste rather than stored. Where to Find Nutritional Yeast? Nutritional yeast is a lot more common than it used to be, so you might be able to find it in larger grocery stores, depending on where you live. If your local grocery store has a health foods section, check that out and watch for the brands like Bob’s Red Mill or Bragg. If you can’t find it in your nearest big box grocery store, it’s available at stores like Whole Foods and other natural and health food stores. Whole Foods carries it in bulk which is handy and if you can’t find it in bulk, you can buy packaged nutritional yeast from a number of different brands. It’s also readily available from online retailers like Amazon and Thrive. 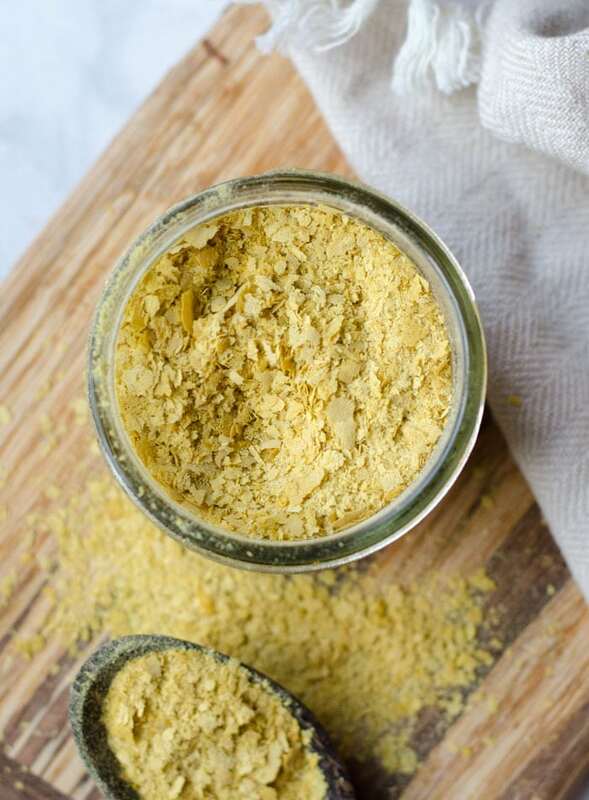 Nutritional yeast offers many health benefits, especially in a vegan diet, making it not only a delicious addition to any meal but a great way to increase its nutritional value. a full spectrum of B vitamins: thiamin, riboflavin, niacin, folate, B6, pantheonicc acid, folic acid, niacin. Low glycemic. Contains no added sugar and is a low carbohydrate, high fiber food meaning it’s digested slowly with little effect on blood sugar levels. Full spectrum of B vitamins. Important for many processes in the body. They help to convert food into fuel to keep us energized and while many of them work together they each play their own role in our health as well, from healthy skin and hairs, to working as antioxidants, to their role in mood, sleep and brain health, B vitamins are key nutrients for optimal health. Good source of zinc. Optimizes the metabolism of carbohydrates which is important in maintaining stable blood sugar levesl, supports overall energy and immune health. Source of magnesium. Important in heart health and supports digestive health, a healthy metabolism, strong bones and hundreds of other reactions in the body. A complete protein. Contains all essential amino acids with 8 grams of protein per 2 tablespoon serving, making it a complete protein. Amino acids are the building blocks of proteins that support every aspect of our physical and mental health, provides energy and supports healthy skin, hair, eyes and muscle. Thiamine. Used in combination with B vitamins to help regulate functions of the cardiovascular and digestive systems. Thiamine is used in nearly every cell in the body and supports healthy energy levels and healthy metabolism. Fiber. Important for a healthy gut and functioning digestive system and blood sugar regulation. Nutritional yeast packs 4 grams of fiber per serving. Source of chromium. Important for maintaining healthy blood sugar levels. Nutritional yeast is a good source of B12 but it doesn’t contain it naturally. Most (not all nutritional yeast is fortified with B12, so check the label before buying if that’s something you want) nutritional yeast is fortified with B12 in processing. No matter though, at the end of the day, it still contains B12 that your body can use and this makes it a good food for vegans and vegetarians to eat regularly. B12 deficiency can be seen among vegans and vegetarians especially if eating balanced, whole food, plant-based diet is not being made a priority. It can be identified by symptoms such as fatigue, lightheadedness, shortness of breath, nerve issues such as numbness or tingling and vision problems. Vitamin B12 is a key nutrient in the body and helps to create strong nails, hair and skin as well as reduces fatigue, helps to maintain a healthy digestive system and regulates our central nervous system. Even though nutritional yeast and other fortified foods can be a good source of B12, I would still recommend taking a sublingual vitamin B12 supplement if you don’t eat animal products. Liquid, sublingual B12 enters the bloodstream directly and doesn’t have to be digested making it easily absorbed. There are a number of good brands available. I like Garden of Life Liquid B12 Spray. Read more about B12 and other nutrient considerations for a plant-based diet in my vegan nutrition guide. Gram for gram, nutritional yeast is very high in protein, especially for a food in the plant kingdom. It also contains all essential amino acids, making it a good food for recovery and repair. 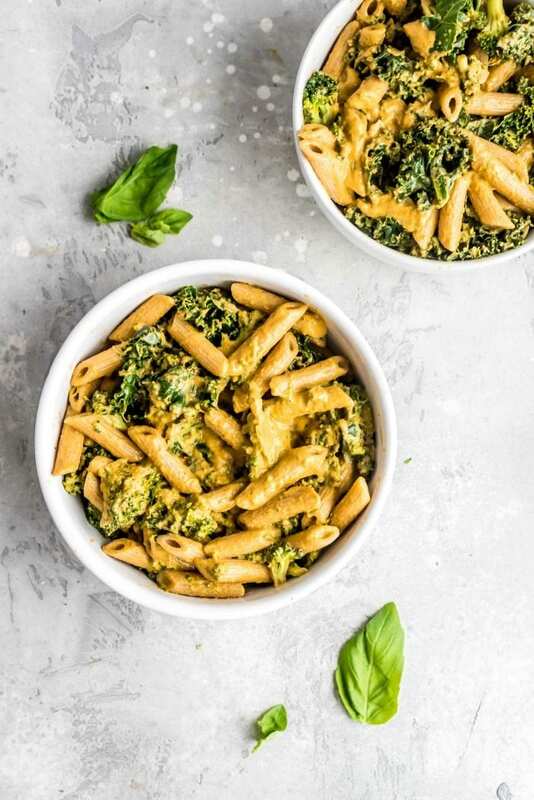 While you’ll still have to include a range of healthy plant foods to get your protein in, using nutritional yeast is an easy way to get an extra 5-10 grams a day. You can read more about this in my vegan protein sources guide. Nutritional yeast is very low in carbohydrates and fat while still being high protein, which not very common in the plant world. Many plant foods such as beans or nuts, while considered to be high protein, are also high in carbohydrates or fats. Not only is it high in digestible protein, it’s also low calorie making it a good way to sneak in some extra protein throughout the day. If you’re an athlete or just trying to build muscle while eating a plant-based diet, nutritional yeast is an excellent choice for that very reason. 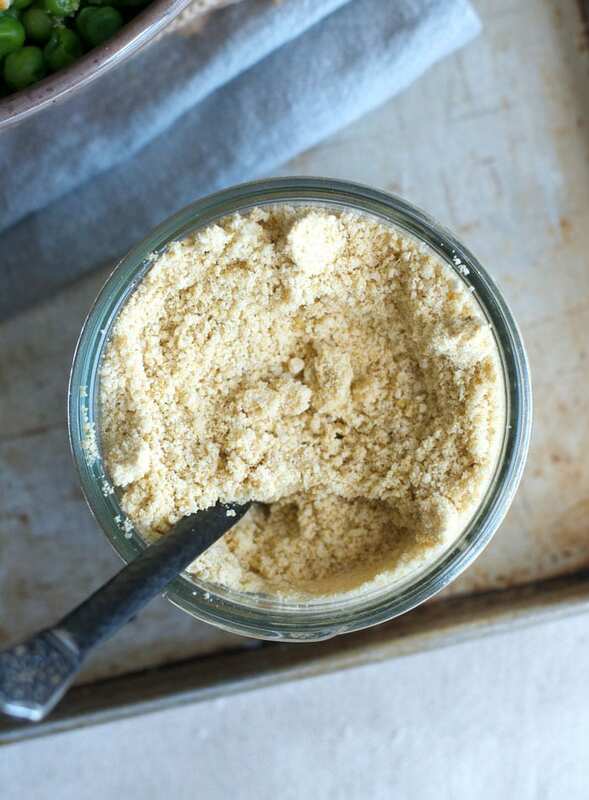 Aside from its many health benefits, nutritional yeast is most loved for it’s delicious nutty, cheesy flavor. It’s affordable, easy to use and can be sprinkled on just about anything to produce a yummy cheesy taste without the need for processed dairy alternatives. I frequently use nutritional yeast as a seasoning, sprinkling it over just about anything, but it’s also awesome added to recipes likes soups and sauces in place of cheese. 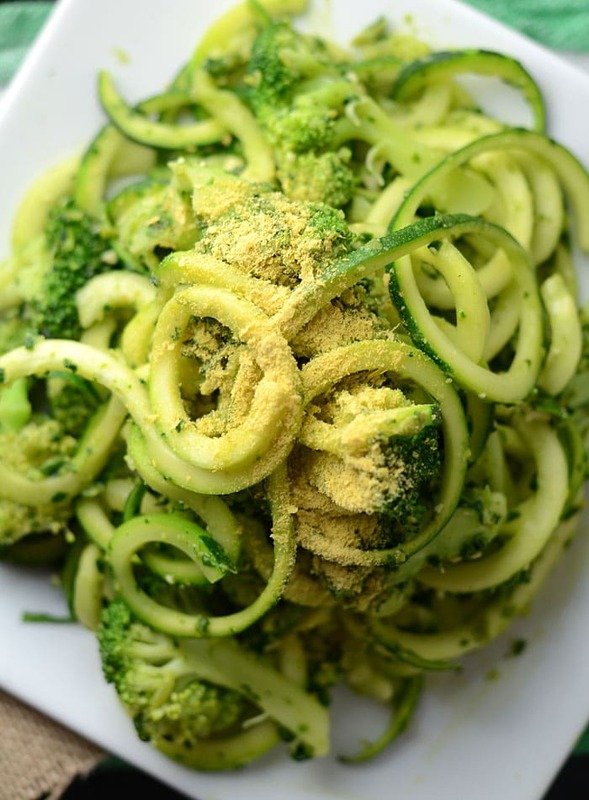 I even use it in sweet recipes to create a delicious sweet and salty contrast and I almost always have a batch of vegan parmesan cheese in my fridge which is my favourite way to use nutritional yeast. 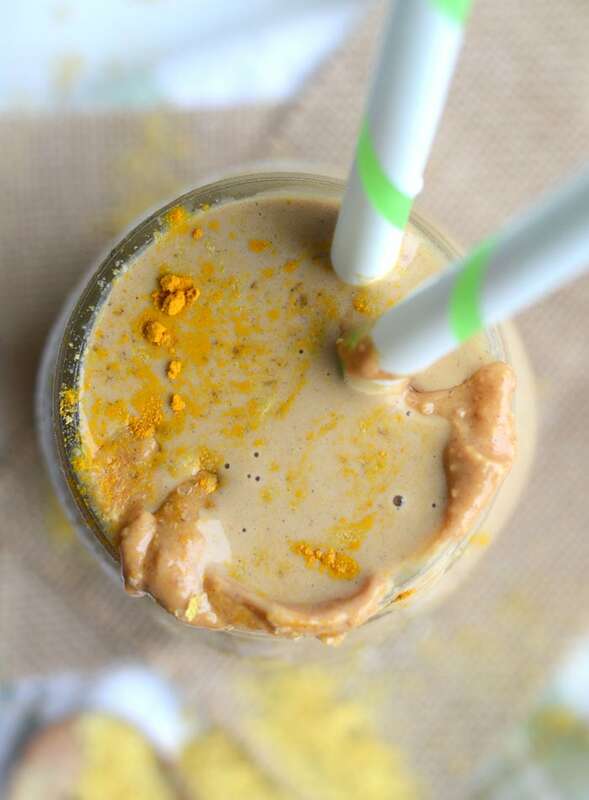 Here is a ton of fun and delicious uses for nutritional yeast. Sprinkle over any pasta dish. Sprinkle it over vegan pizza. Sprinkle it over vegan chili. Sprinkle it over half an avocado with salt and pepper. Use it in salad dressings and dips. Sprinkle it on roast vegetables before baking. Toss it with homemade fries before baking. Mix it with salsa for a quick, healthy cheesy dip. Add it to tofu or chickpea scrambles. Spread toast with olive oil and then sprinkle on top. Mix a few tablespoons into rice with steamed veggies. Use it to make cheesy kale chips. Mix it with steamed brussel sprouts for cheesy flavor. Sprinkle it over steamed broccoli. Sprinkle it over popcorn with a bit of coconut oil or vegan butter. Mix it into mashed potatoes or mashed cauliflower. Make vegan garlic bread by spreading a baguette with vegan butter, nooch and crushed garlic. Those are just a few ideas to get you started. There is really no end to the ways you can use nutritional yeast in your kitchen. As you can see from the recipe list, I even use it in dessert and smoothies. 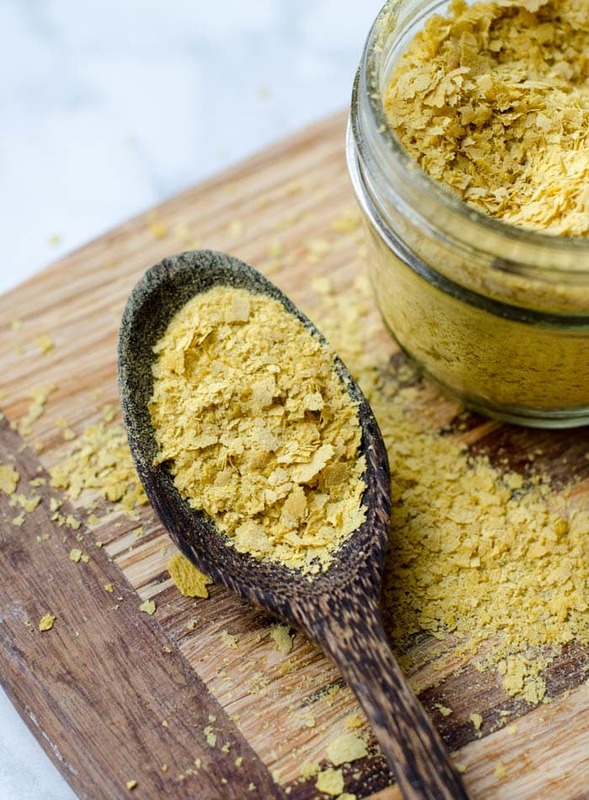 From sweet to savory to smoothies and sauces, nutritional yeast is versatile, nutritious and a must-have staple, especially in a plant-based kitchen. Buy it for its many health benefits and enjoy it for its delicious cheesy savory flavor. Ready to Try Nutritional Yeast? If you’re ready to take the plunge and give nooch a try, I recommend the following brands. Great information! Is it true that “nooch” has MSG in it? I saw a a argument on YouTube about it containing MSG. And people don’t feel good after eating it. No, nutritional yeast does not contain MSG. It does naturally contain glutamic acid (glutamate) but it’s bound to other amino acids or proteins and is processed differently in the body than the glutamate in MSG, essentially the body can control how much is absorbed and the rest can be passed off as waste rather than stored. I’ve never heard of people not feeling good after eating it..I always feel fine but, everyone is different. I bought nutritional yeast for a vegan recipe and was left with a big container left over that I did not know what to do with. Your article was well-timed! HI, YOU HAVE SUCH GREAT INFORMATION & RECIPES!, DO YOU RECOMMEND A CERTAIN BRAND AND/OR SHOULD I BUY IT WITH THE VITAMINS OR WITHOUT?, MOST SAY WITHOUT, WHAT DO YOU THINK? I buy it with it but I’ve never seen it without in my area. I use it as a source of B12 in my diet, a few times a week so I’m okay with it being fortified. I’ve only tried Bob’s Red Mill, Hoosier Hill Farm and Bragg’s and they’re all good. I usually buy in bulk from my local natural food store though.